Here’s the best thing about Discovery Channel HD, the free iPad app from Discovery Communications: every week is Shark Week. Here’s the worst thing: it’s going to be a short week. It’s not that there’s not a lot of stuff on the Discovery Channel app. It has an iPad-optimized version of the cable channel’s well-rounded Discovery News Website. There’s the programming schedule, letting you know when your favorite show will be on. And there’s video from most of Discovery’s shows, including Myth Busters, Dirty Jobs, American Chopper, Deadliest Catch, and the aforementioned Shark Week content. 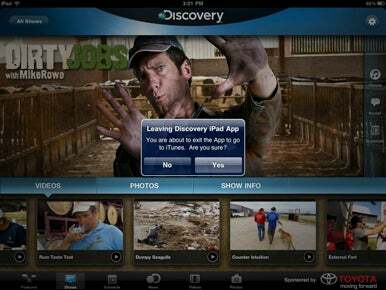 New Discoveries: Discovery Channel HD delivers plenty of clips to your iPad, but if you want full video from the shows, you’ll have to leave the app to find it. The videos can be shared via Twitter, Facebook, and e-mail. And there are a lot of them. But they are quite short—ranging from 90 seconds to three minutes, as a general rule. That’s enough to give you a taste of the show, but not necessarily enough to entertain or inform on its own. (In one Shark Week clip, for example, we don’t actually see a shark until 20 seconds are left in the video.) It’s a bit of a tease, actually designed to get users to run to the TV or to iTunes, where they can buy the full video immediately. As a bit of advertising then, Discovery Channel HD does the job. As a standalone iPad app, however, it leaves the user frustrated—like a hungry shark trying to fill up on sardines.